I'm so excited to have Ashley Aspinwall of SideSmile Style here today to give us a glimpse at her personal Shoe Stories. This cutie patootie style blogger is originally from Dallas, Texas, and currently making her fashion mark at The University of Missouri. Ashley's unabashed feminine style combined with youthful essence and on the mark trend worthiness makes SideSmile Style a must read! If I’m being honest flats, although my short legs look considerably better in heels. If you were a shoe, what style would you be and why? I think I would be a lanvin ballet flat, classic and modern at the same time. They’re seemingly low maintenance, but still fancy. Most expensive shoe in your closet? I saved up money from my first retail job in college bought a pair of Jimmy Choo Motorcycle boots. They’re definitely one of my go to pieces and I love styling them in unexpected ways. I have a major shoe crush on Rebecca Minkoff’s Mabel Strappy Booties. I NEED them. Why do you think women gravitate towards shoes? How do you store/display your shoes in your closet and do you have any tips for keeping them in good shape? I keep all of my shoes in my hall closet organized by season, type, and color. It makes it a lot easier when I’m rushing in the morning! I also use Protect Your Pumps on my more expensive heels to keep them looking new. Either Olivia Palermo or Blake Lively. These shoe posts make me so happy! I love shoesies! I always swoon over Ashley's shoes, so I loved this! Great feature! Fabulous shoes and all-around fabulous style! Miss Ashley is one of my daily reads :) Great feature! I just LOVE her!! I am dying over those Valentino bow sandals..come to mama! The dotted pants are rocking. 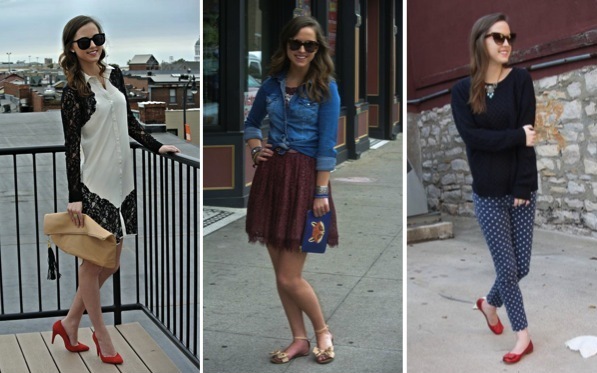 She has the cutest blog and I'm so jealous of her shoe collection!